Opioid addiction costs many lives and harms livelihoods. Case and Deaton (2017) highlighted increasing midlife mortality due to suicides and drug and alcohol abuse since the late 1990s contributing to relatively modest gains in life expectancy. In the past decade, overdose deaths have surged, particularly as (illicit) synthetic opioids have become more available. Opioid-related deaths touch urban and rural communities alike and are spreading to affect all demographic groups. 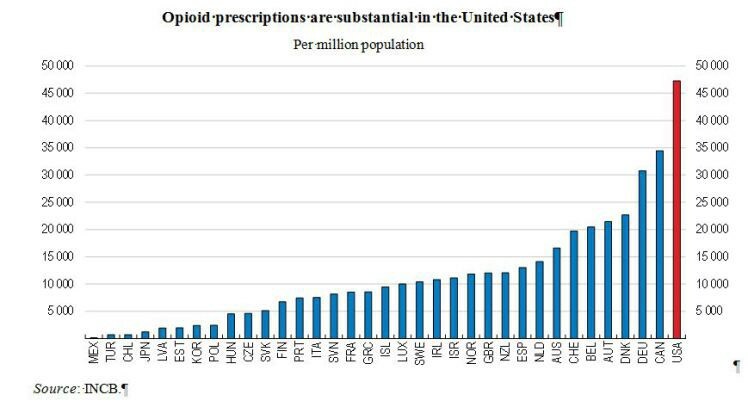 Opioids are far more commonly prescribed in the United States than elsewhere in the OECD. Between 1999 and 2014, opioid prescriptions in the United States quadrupled. This was compounded by relatively liberal policies on the number of opioids being prescribed, the long duration of treatment and aggressive marketing. Ultimately millions of individuals were exposed to addictive substances, either the intended patient or through unused drugs being taken by family members or others. The consequences of the opioid epidemic are felt through deaths, the impact on livelihoods and by breaking up homes and communities. 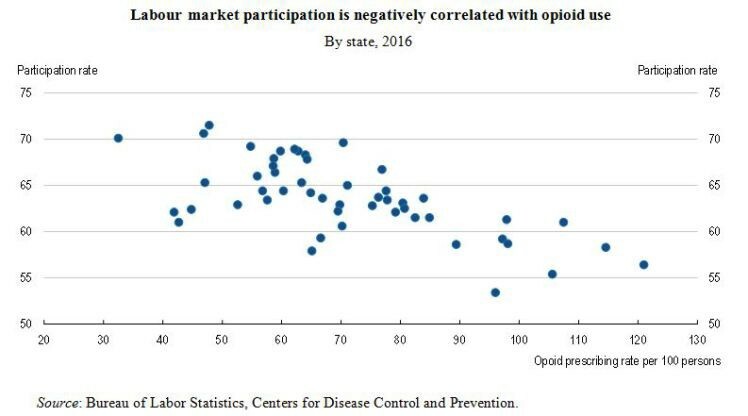 Opioid use appears to be connected to labour market conditions with prescription rates typically higher where labour force participation is lower. Krueger (2017) found that around one-fifth of the non-participating prime age males were regularly taking opioid painkillers. While causality is difficult to establish opioid addiction ultimately impairs participation. This contributes to costs to the economy of lost wages and productivity, as well as fiscal costs from foregone revenue and spending on emergency care and the treatment of addiction. Estimates suggest an annual cost of around $80 billion, but if the loss of life is also taken into account then the cost of the crisis in 2015 could be over $500 billion (CEA, 2018). Such losses of lives and enormous impact on society justify taking action. To address the immediate challenge, making drugs that can reverse the effects of overdoses more widely available can reduce avoidable deaths. Efforts to tighten access to opioids will reduce the inflow of patients developing opioid dependence. For those already suffering from addiction, medically-assisted treatments are proven options, but may require relaxing administrative barriers in order to expand their reach. These efforts will need to be complemented by re-integrating former addicts into employment and housing to prevent relapse. Research on the causes and effects of widespread addiction should also be encouraged. OECD (2018), Economic Surveys: United States, OECD Publishing, Paris.